During the years of his training, Dr Tudor has developed a special interest in the meniscus tissue of the knee. He regularly performs surgery to repair damaged meniscus tissue in order to preserve knee function. Occasionally when the damage is too great (this is usually after a number of previous operations), and pain is significantly affecting a person’s life, he will implant a meniscus taken from another knee in an effort to recreate the function of the meniscus and improve the patient’s pain and function. The knee contains two c-shaped pieces of cartilage named the “meniscus”. One is on the inner side (the medial meniscus) and one is on the outer side (the lateral meniscus). The mensici act to share the load passing through the knee during walking, running and jumping along with providing stability and helping the knee move smoothly throughout bending. The meniscus usually transmits more than 50% of the bodyweight going through the knee and damage to it can lead to pain, swelling and stiffness. Loss of a meniscus will eventually lead to arthritis. The meniscus is made of a special type of cartilage that is very good at resisting load but it does not heal well when it is damaged or torn. Damage (often called a “tear”) to one or both of the menisci can occur with twisting injuries to the knee during sport (and may be found at the same time as a ligament tear) or a meniscus may slowly degenerate as part of the wear and tear process seen during arthritis. A lot of meniscus tears (especially those associated with wear and tear) do not need surgical treatment and often pain and swelling will settle with time and some muscle strengthening exercises. However, some tears are so severe that they completely disrupt the meniscus – surgery is usually required to repair these tears or else they will not heal. Surgery for meniscus tears is generally key-hole (arthroscopic) and may involve trimming or removing part of the torn meniscus (partial meniscectomy) or repair of the meniscus with various stitching techniques. Meniscus repair can be complex and difficult surgery and has an overall success rate of between 75-85% but does require careful protection after surgery and prolonged rehabilitation. Occasionally if a partial meniscectomy is performed or if a meniscus tear does not heal or is irreparable, people suffer ongoing pain, swelling and limited function. This is often termed “post-meniscectomy syndrome” and can be extremely debilitating. In some patients (generally active patients with little or no arthritis in their knee) there is an option to implant a meniscus to replace the damaged one. This is termed Meniscus Allograft Transplantation and uses a meniscus that is taken from an organ donor. The meniscus does not contain immune cells and so tissue rejection is not seen and anti-rejection medication is not required. Dr Tudor has published a number of scientific papers and a book chapter on meniscus transplantation and continues to research this fascinating field. Current research suggests that the transplanted meniscus can improve pain and function and often will last for over 10 years. Some meniscus transplant recipients have reportedly returned to competitive sports but it is probably more realistic to aim for pain-free daily life and resuming non-impact activities such as swimming and cycling. In the last month, Dr Tudor has performed two meniscus transplants and he believes that this operation, along with other biological reconstruction techniques are likely to become far more common in the next few years as we fight to preserve each patient’s own knees to try to avoid joint replacement surgery. Dr Tudor wishes his recent meniscus transplant patients a speedy recovery! 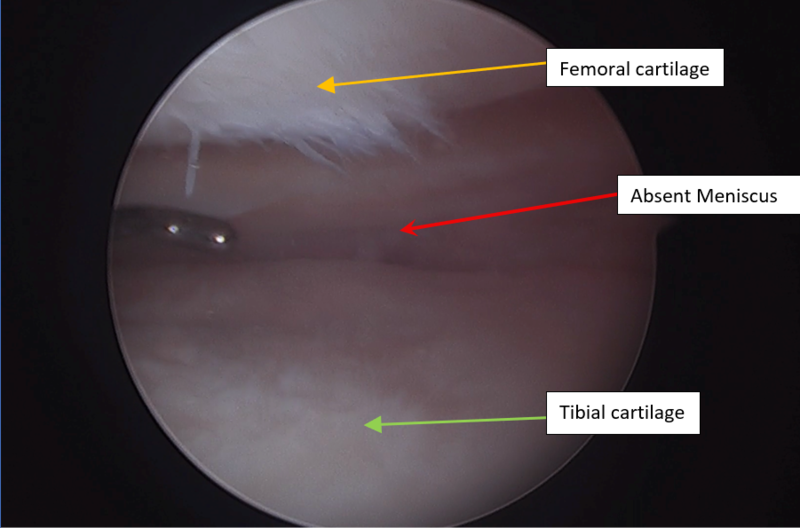 Arthroscopic view of the knee demonstrating absence of a meniscus buffer between the cartilage of the femur and tibia.